The small diameter end of line heating tube (single head electric heat pipe单头电热管), always found two lead short-circuit, open-circuit disconnection, problems such as line between appearance, due to small volume and improve equipment with high energy requirements for heating pipe, many manufacturers blind material and production, resulting in the decline of the quality of the heating pipe, frequent problems. A lot of people, problems have arisen, not to analyze, find the problem, easy to conclude that electric heating tube, magnesium oxide core rod winding silk quality problems. Making magnesium oxide core rod manufacturers of the original magnesium content is 95% of magnesium oxide to 98% or even 99% of the purity, in order to improve the two pinout does not produce short circuit probability, but the fact is not true. So the cause of electric short circuit单头电热管短路, open circuit is what? Two hole 1, wear pinout the distance is too close. 2, the position of fever has moved to the outgoing line port, and exposed in the air. 3, the high temperature caused by short circuit, the necessary and sufficient conditions of rated voltage two lead-out wire. 4, the mold in the use of holes in a horn mouth aperture, this is due to defects in the drilling process module, thermal effect. 5, pipe in mouth end pinout appear powder loose phenomenon, thus affecting the heat conduction and breakdown in air. Sealing silica gel 6, inferior and lead wire of the root first ring screw distance is too close, then the production process. 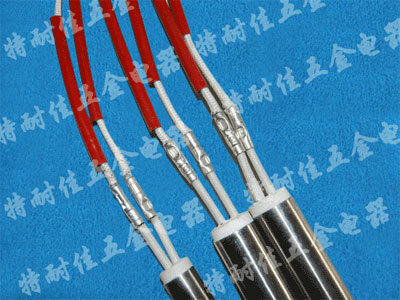 7, with iron chromium aluminum as excessive resistivity leads to increase the temperature of the lead wire and the emergence of accident. In the design, single head heating tube production process, resistance heating pipe size, determines the power of a heater, GB stipulates, electric heating tube power error range and an electric heating pipe resistance error range, the following article I will introduce how to calculate the 1 aluminum heating pipe resistance range value, heating in what resistance within the tube is in conformity with the relevant standards.